Another day, another #PSLoveMe Challenge to complete. Today, we are suppose to share one thing that's just for us. Just for me? As difficult as it is for me to take time for me, have something just for me, or buy something just for me... I think that the one thing that's just for me that I enjoy most is my blog. I love being able to share my experiences with others and my blog is the perfect outlet for that! What is the #PSLoveMe Challenge? #PSLoveMe is a challenge to learn to love you. Everyday there will be a prompt for you to look at yourself, embrace who you are, and hopefully help you learn that you are beautiful, you are amazing, and you need to love who you are. How do I participate in #PSLoveMe? Everyday there will be a prompt, you can share an instagram, a tweet, a blog, a video or even just in our fb group page that was inspired by that prompt. Just make sure if when you share add the hashtag #PSLoveMe. 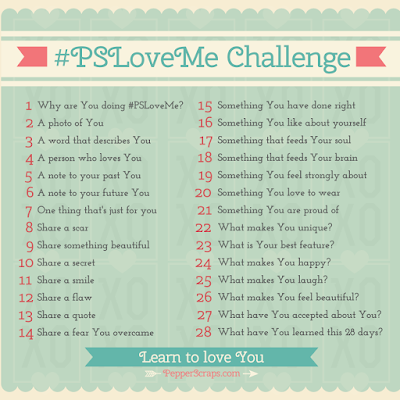 Download the #PSLoveMe challenge prompts image and upload to Instagram or share on your blog. (Please don’t crop off the PepperScraps.com and link back to her on instagram (@unicornbeauty). What is one thing that is just for you? Join the Swagbucks Birthday Bash TODAY!